The idea is both to expand options and to solve a common complaint by Capital Bikeshare riders: finding no available space at a bike-share dock at the end of their trip. WASHINGTON — Those who love bike sharing in D.C. might soon have reason to like it even more. The District’s Department of Transportation is experimenting with making bike sharing more convenient by testing “dockless” bike-share systems. DDOT is accepting applications from companies who operate such freestanding bike systems in other cities. It will then pilot the program starting Sept. 20 through April 2018. The idea is both to expand options for bike-share users and to solve a common complaint by riders who use the bright red Capital Bikeshare bikes: finding no available space at a bike-share dock at the end of their trip. That can cost time — because they have to pedal on to the next available dock in the area — and money — because every extra minute on the bike can mean an added charge. 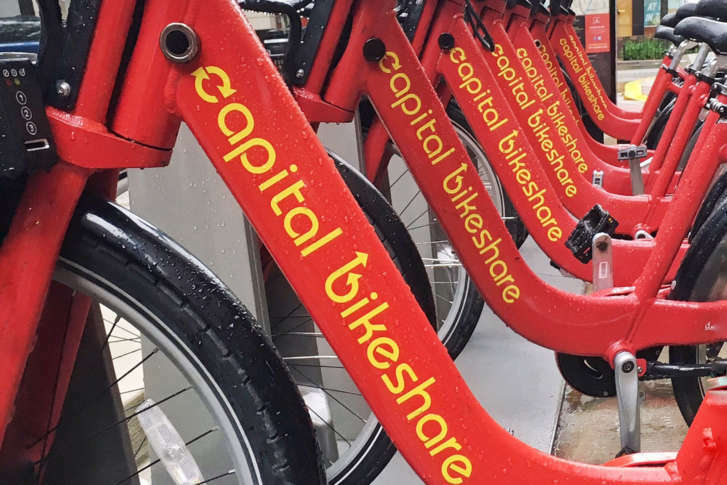 Capital Bikeshare customers are tethered to a system that demands that the bikes be picked up and dropped off at bike-share “docks.” This leaves room for improvement and competition, says Sam Zimbabwe, DDOT’s chief product delivery officer. “We hear from users a lot about full docks,” he said. There’s also the opposite problem: docks without any bikes available for pickup. “So we think there’s opportunity for increased bike share,” Zimbabwe said. And that could come in the form of freestanding bikes offered by such companies as Spin and LimeBike. Systems like LimeBike’s — in which riders can pick up a freestanding bike anywhere and drop it off anywhere — are being tested in a number of U.S. cities. Users download an app on their phones and then scan the code on the bike, which releases a bike lock so users can take a ride. LimeBike operations teams are tasked with “balancing” the bikes, making sure that the distribution is spread throughout the city, and recovering bikes that may be parked in out-of-the-way places. Inconsiderate riders, however, have presented challenges: There reportedly have been complaints of parked bikes blocking sidewalks or building entrances. Maggie Gendron, LimeBike’s strategic director, said the company works hard to educate users on considerate parking. The company is among those putting in an application to operate in D.C. Most LimeBike users tend to park their bikes in a responsible manner, Gendron says, and they “self-police.” Many users, for instance, let LimeBike know when another user ditches a bike irresponsibly, she said. “When they see people doing inappropriate things with the bikes, or not parking the bikes correctly, they let us know through social media,” Gendron said. LimeBike also works closely with cities, she said, to ensure their policies don’t conflict with local bike-parking regulations. Being “dockless,” unfortunately, has also opened the door to rider mischief, with riders parking in out-of-the-way places. One, for example, was left atop a piling in Lake Washington in Seattle’s Sand Point neighborhood. DDOT is taking feedback from residents who may have used freestanding bikes in other cities or who have concerns about how a freestanding bike service could operate in the District, Zimbabwe says. “We’re interested in hearing from residents on how to structure the program even before we start,” he said. You can offer your thoughts on the program by emailing publicspace.policy@dc.gov.